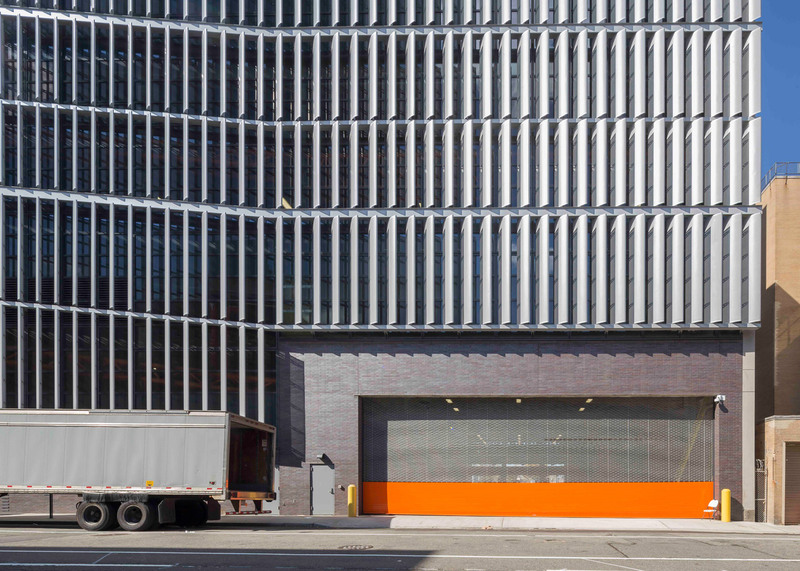 New York firms Dattner Architects and WXY have completed a rectilinear garage wrapped in a metal fins and a sculptural salt shed made of reinforced concrete for the city's sanitation department (+ slideshow). 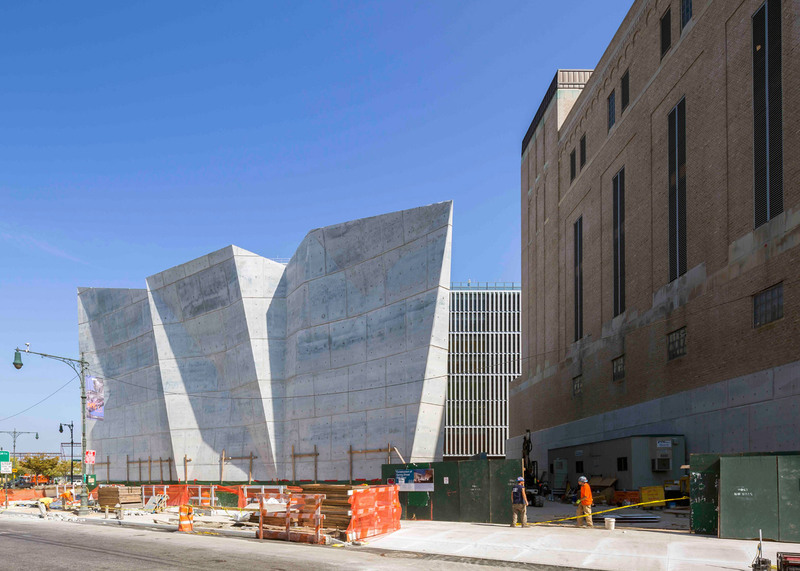 The project is located on a prominent site along the west side of Manhattan, on the northern edge of the Tribeca neighbourhood. 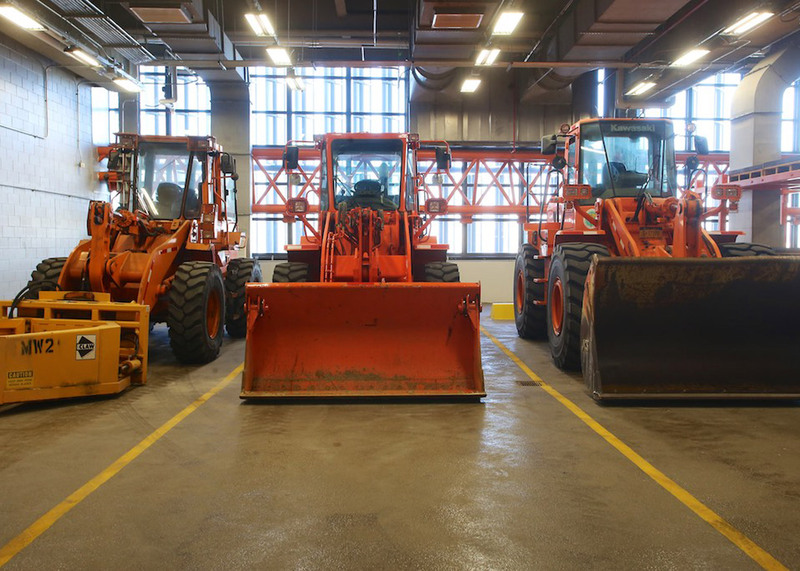 The complex consists of two structures: a large mixed-use building with offices and facilities for sanitation vehicles, and a storage shed for road salt. The two buildings sit across the street from one another. Both were designed by Dattner Architects in collaboration with WXY Architecture + Urban Design. 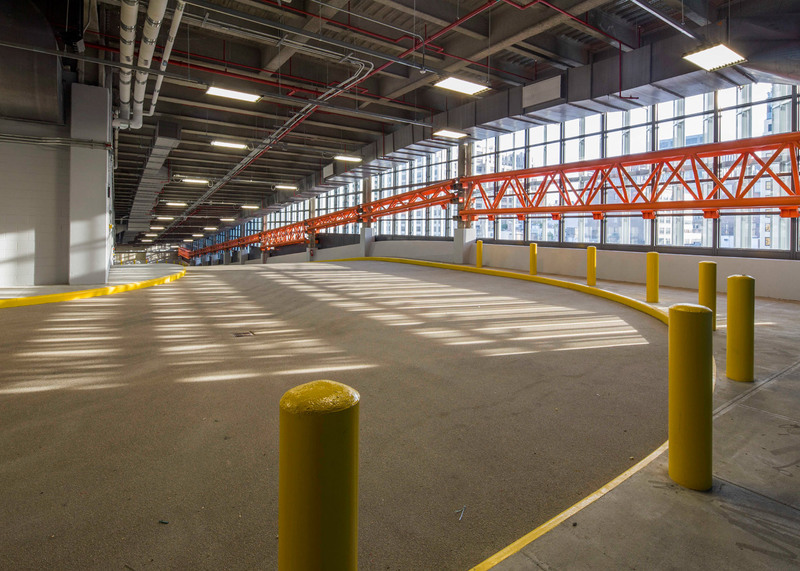 The architects set out to create utilitarian buildings that embodied "design excellence". 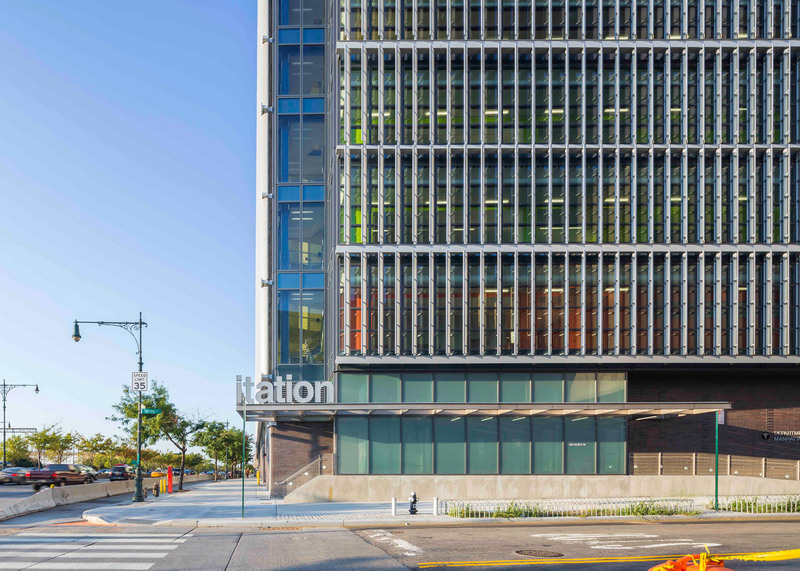 "The design team's approach to incorporating infrastructure at this prominent location is grounded in a commitment to civic architecture, design excellence and environmental responsibility," said the firms. 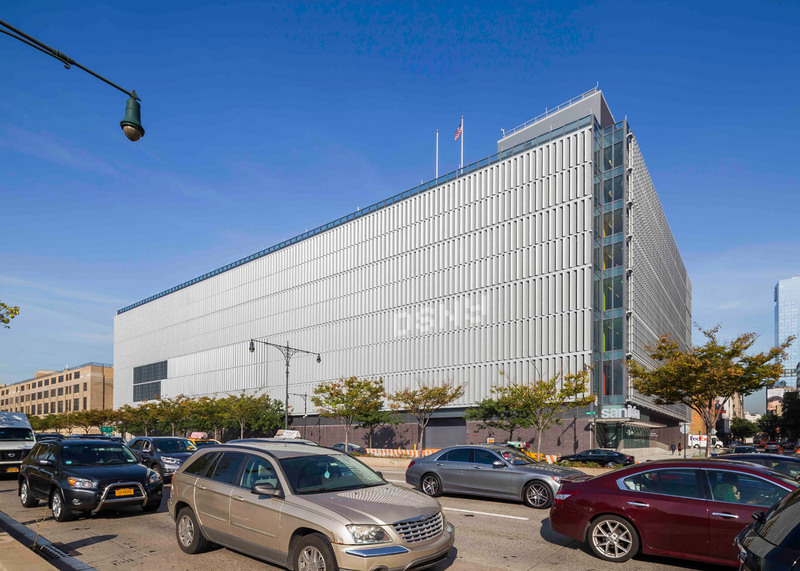 "The site is a key gateway to the Soho neighbourhood and overlooks Hudson River Park and the Hudson River," they added. 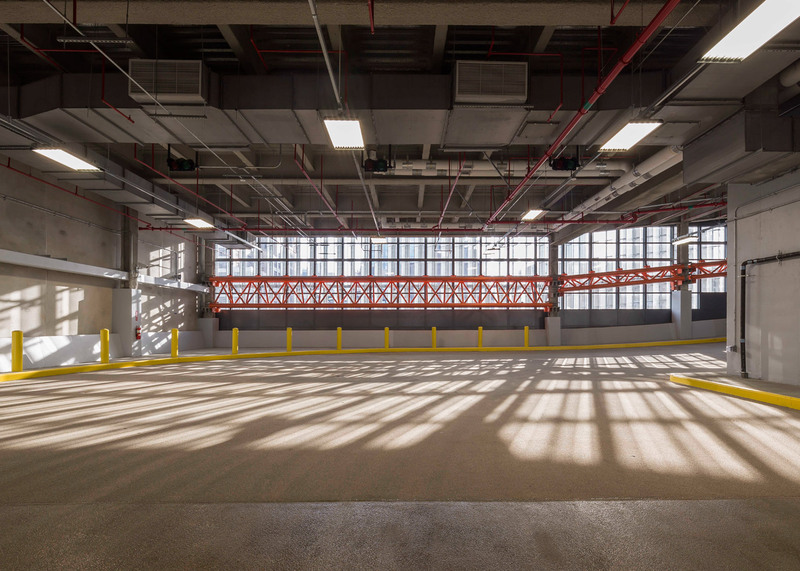 The main building – the Manhattan Districts 1/2/5 Garage – takes its name from the city districts that it serves (one, two and five). 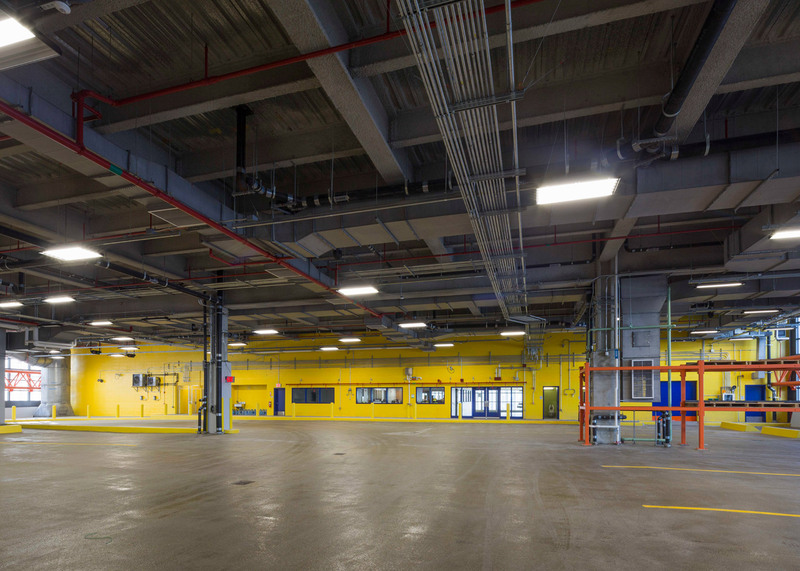 Encompassing 425,000 square feet (39,500 square metres), the building accommodates over 150 sanitation vehicles, with spaces for parking, fuelling, washing and repairing. 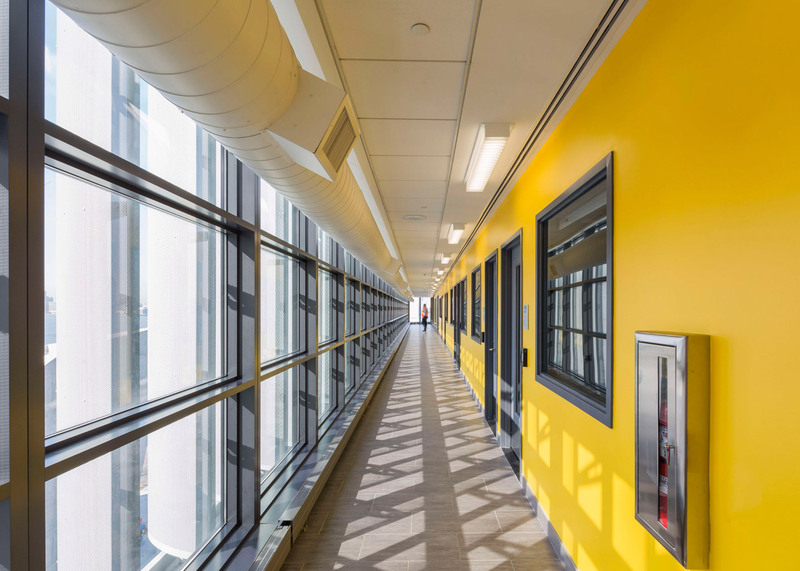 The five-storey building also houses offices, lockers and eating areas for more than 200 staff members. 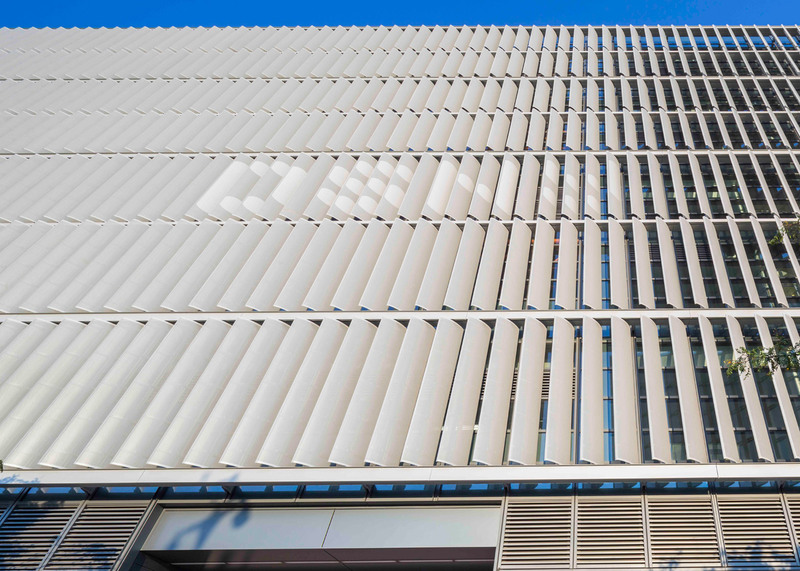 The building is wrapped with a glass curtain wall and a brise-soleil made of 2,600 perforated metal fins. Each fin is 30 inches wide (76 centimetres) and varies in length. 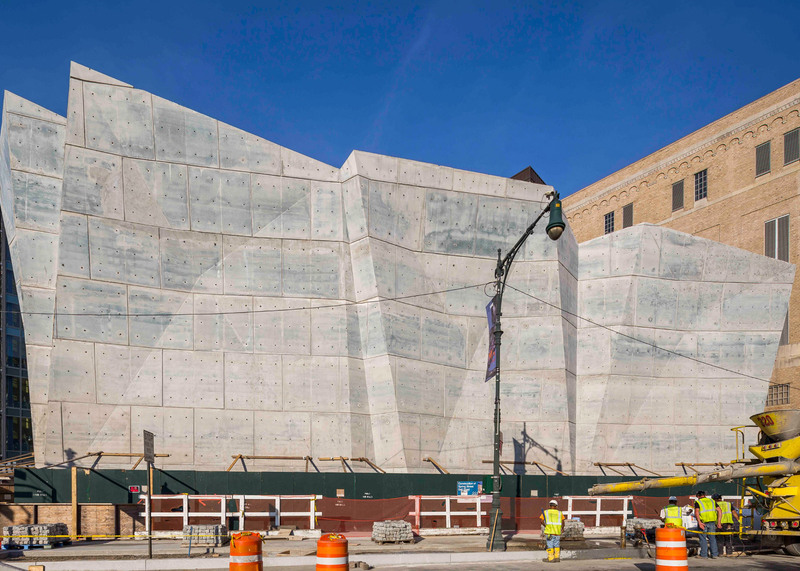 The screen reduces solar heat gain and glare while also "breaking down the project's mass into smaller, rhythmic elements," said the designers. 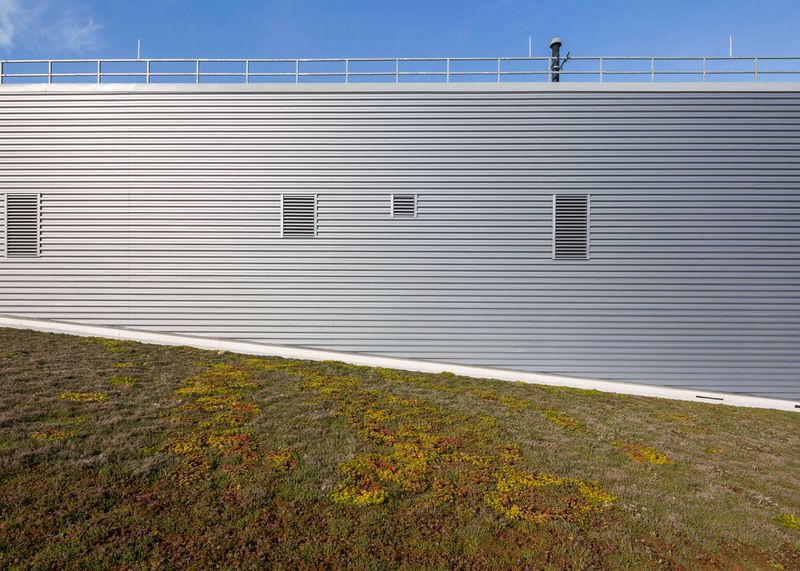 Moreover, it obscures views into the facility while still enabling occupants to see out. 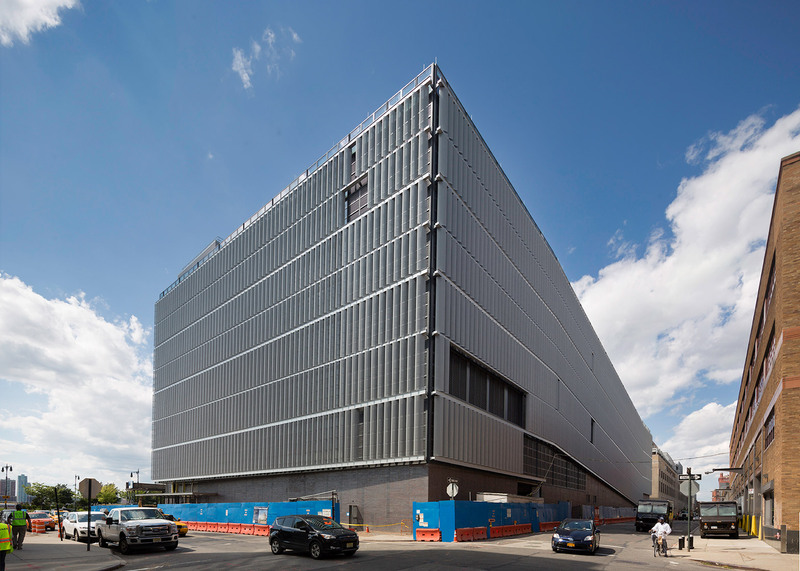 On the south-facing side of the building, the fins move in response to the sun's location. 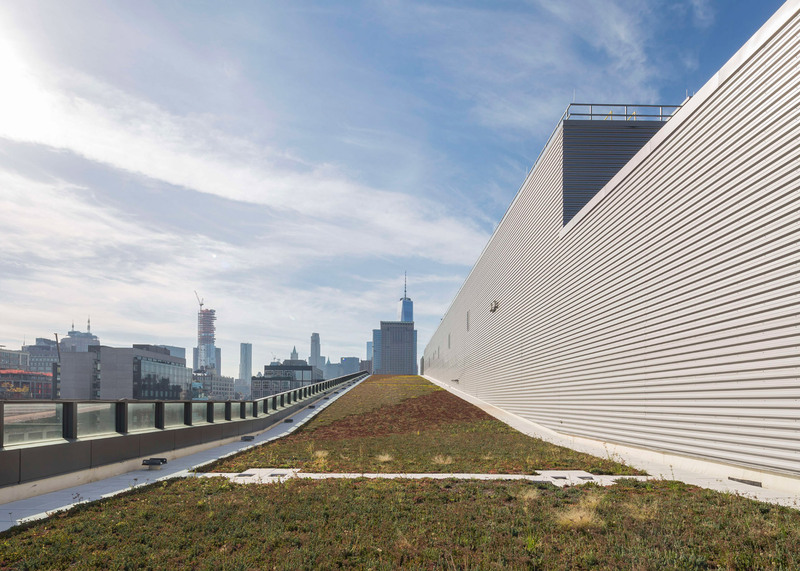 The garage facility is topped with an expansive green roof that consists of 13,250 trays with 25 different drought-resistant species. 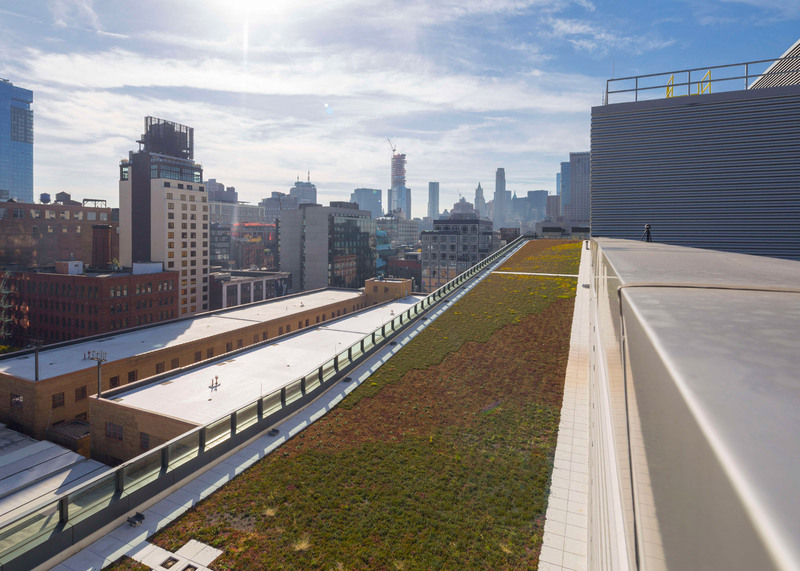 "A 1.5-acre (0.6 hectare) green roof protects the roof membrane, enhances storm water retention and thermal performance, and softens the view from surrounding buildings," said the architects. 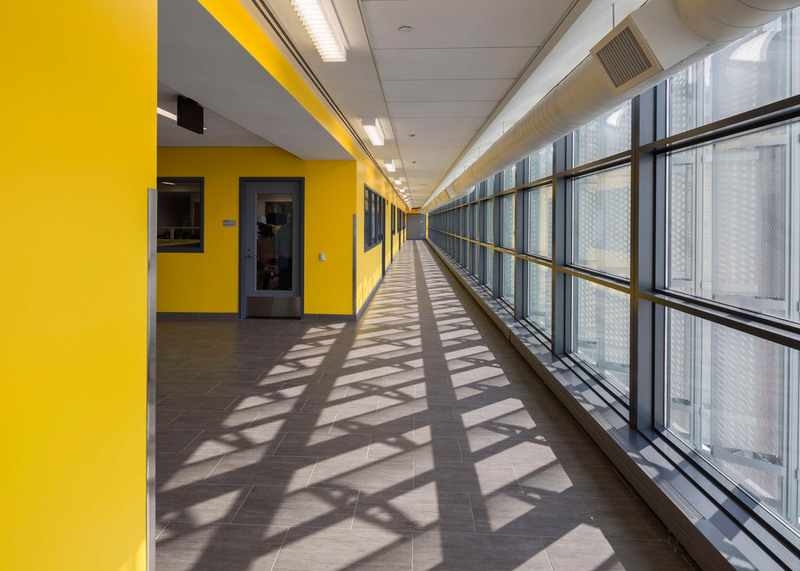 The ground level of the facility is clad in brick and features a glazed entrance. 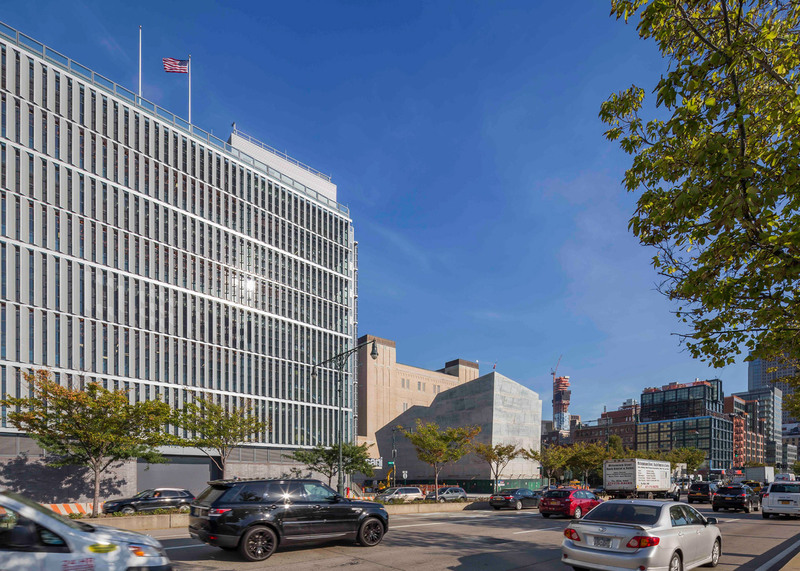 "An articulated masonry base, decorative sidewalk and plantings add to the building's civic character and pedestrian scale," the firms said. Inside, the various levels have designated colours, which correspond with the districts they represent. 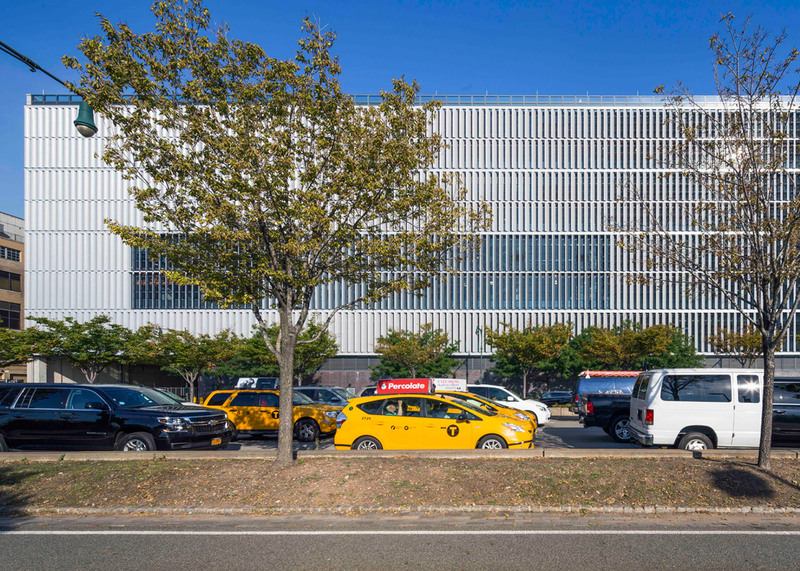 The building is a benchmark project for the city's Active Design program, which promotes architectural design as a means for encouraging movement and fitness among building users. 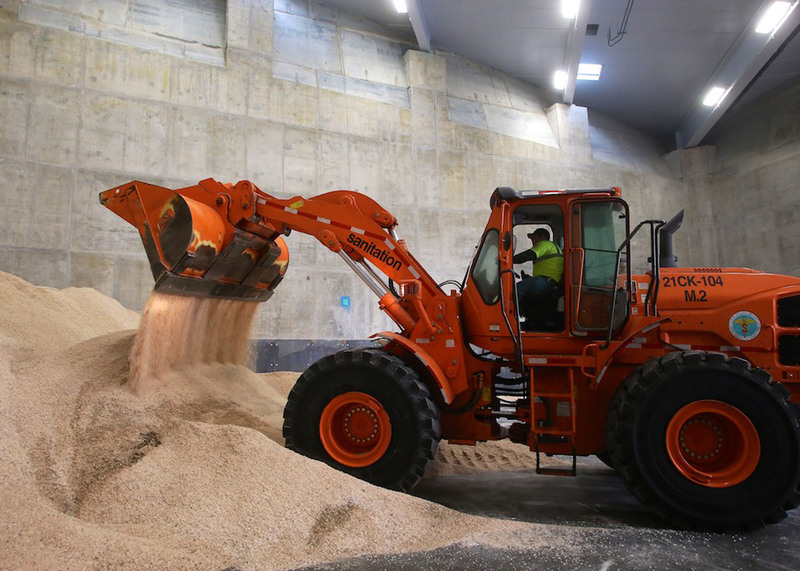 Located across the street is the Spring Street Salt Shed, which serves as a storage facility for road salt that is used to treat icy roads. 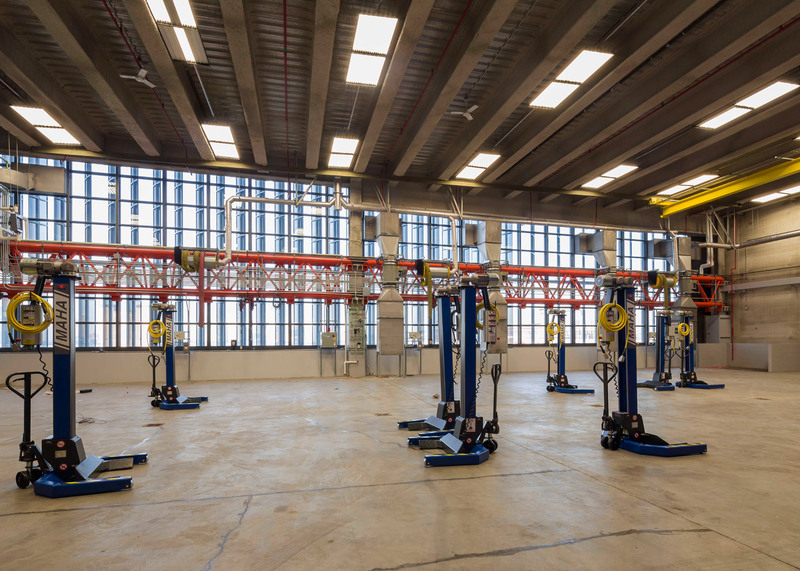 The sculptural concrete building rises 70 feet (21 metres) and totals 6,300 square feet (585 square metres). 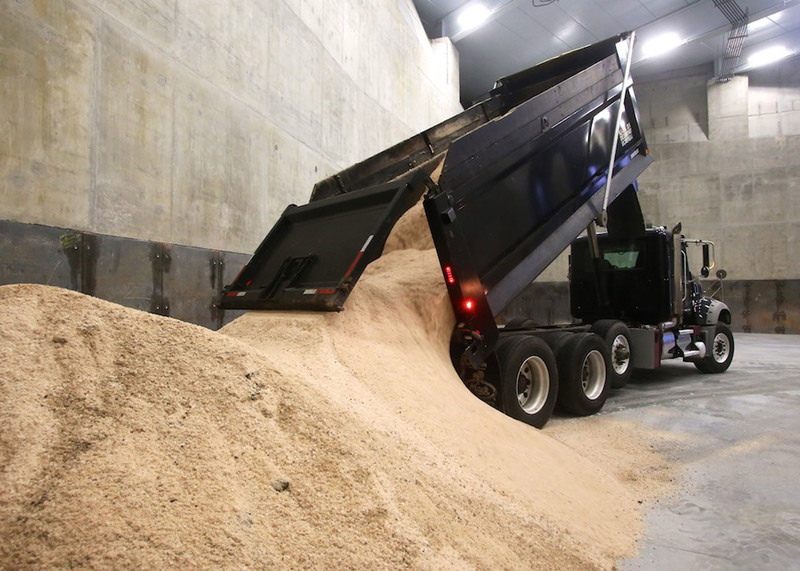 The cavernous building is designed to hold 5,000 tons (5,000,000 kilograms) of road salt. 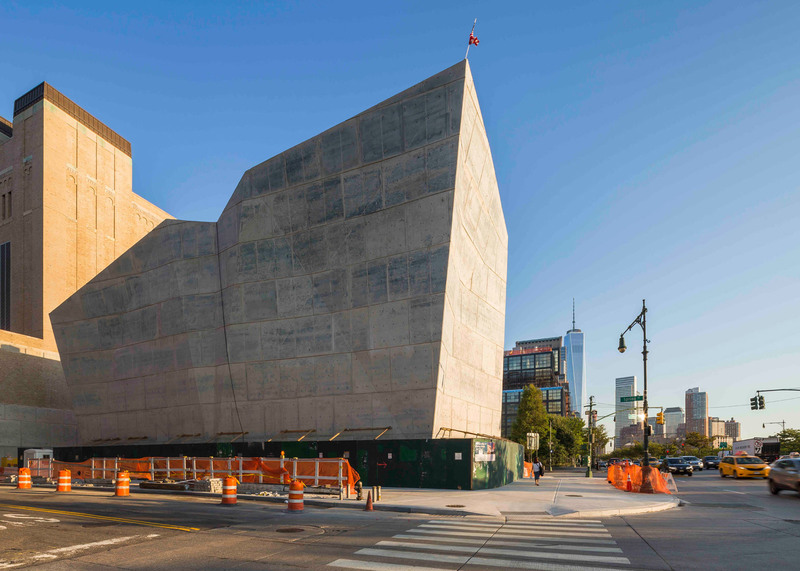 "The Salt Shed's crystalline, faceted planes enliven the reinforced concrete enclosure," said the design team, adding that the building's sculptural form serves as a visual counterpoint to the rectilinear Manhattan 1/2/5 Garage building. When first proposed over a decade ago, the garage and salt shed evoked controversy, largely because of their size and prominent location. Residents complained that the facilities would drive down property values in the area. The controversy has died down, with many now praising the buildings. 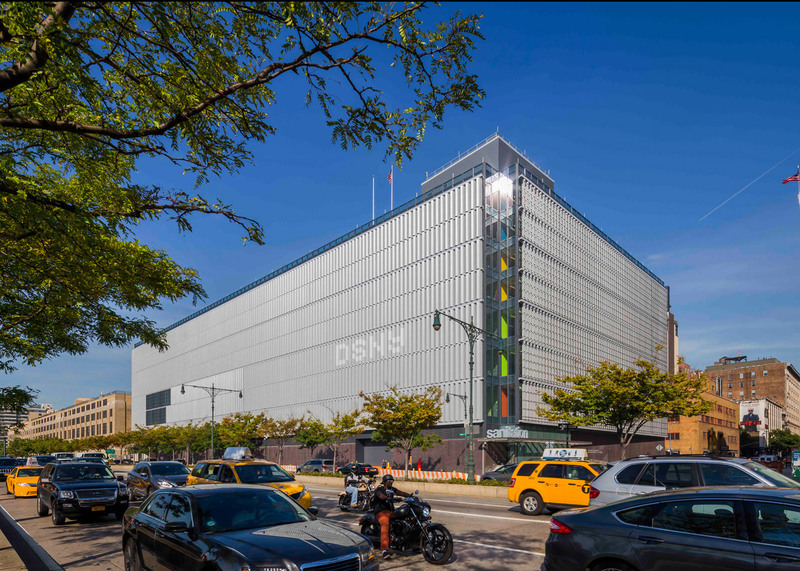 New York Times architecture critic, Michael Kimmelman, recently wrote: "The garage and shed have ended up being not just two of the best examples of new public architecture in the city but a boon to the neighbourhood." 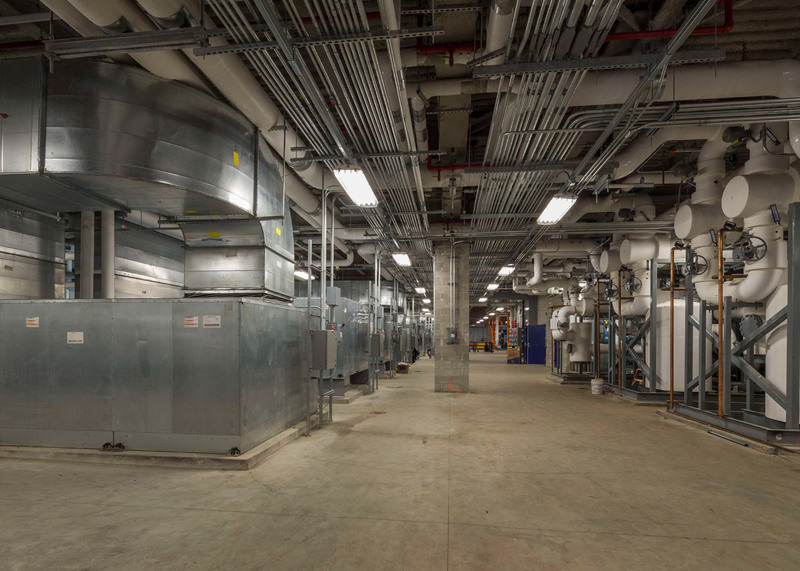 For job opportunities at Dattner Architects, visit their company profile on Dezeen Jobs. Photography is by Wade Zimmerman, unless otherwise stated. 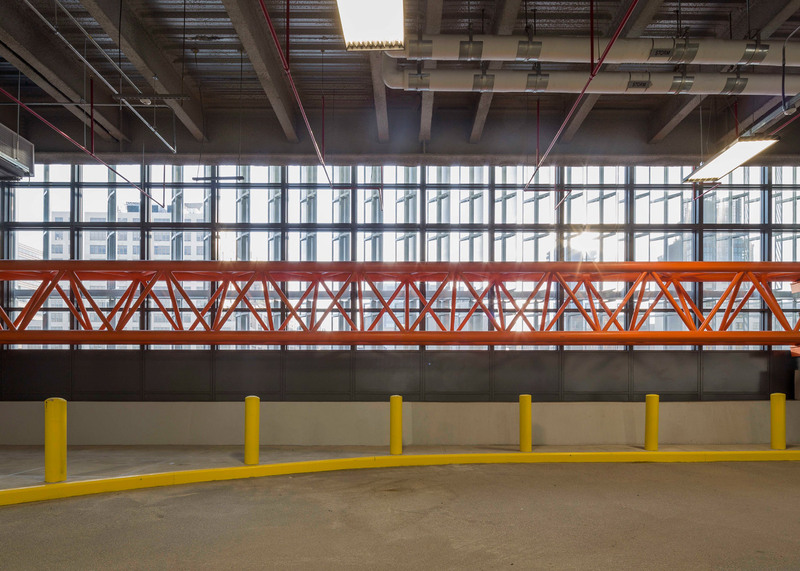 Curtain Wall Consultant: Front Inc. Lighting Designer: Domingo Gonzalez Associates, Inc.